April 2016. 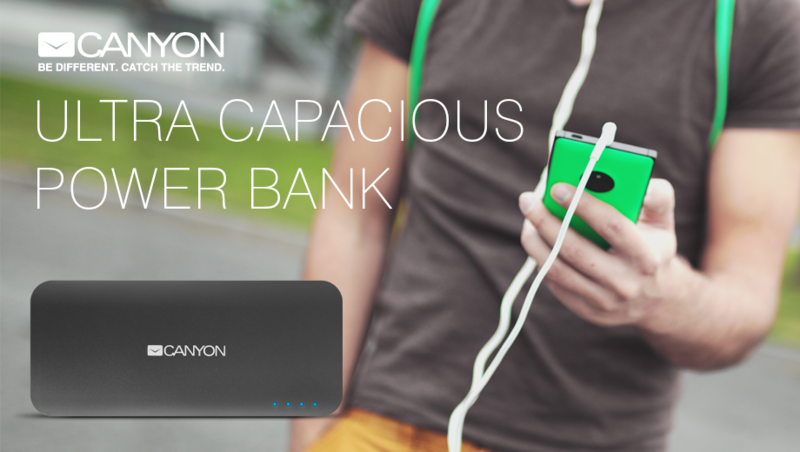 The product line of Canyon Power Banks was supplemented by 2 new ultra capacious units of 13000 and 15600 mAh. Using these devices, you can charge an average smartphone for 5-6 times approximately. This Power Bank is a great tool to use in a city rush or while traveling. You don’t have to worry about the battery level of your smartphone or tablet anymore. The Power Bank can charge two devices at the same time via two USB-ports. The level of charge is tracked by the built-in LED indicator. The Power Bank is charged from a USB port of a computer, or from a power socket. The device’s charging time is around 8-10 hours. The housing of the Power Bank was designed in original Canyon shape in two classic colors: white and gray.